How To Improve Gut Health Naturally? – A Healthy Gut Implies A Healthy Life! Do you know that neglecting your gut health can have a drastic impact on your skin conditions, mental health, immunity and may even cause cancer? How to improve gut health naturally and keep your overall system vigorous? Know 10 secret ways to increase good bacteria in gut naturally so that you take your living one step forward than everyone else! How To Improve Gut Health Naturally? – 10 Ways To Increase Your Gut Power! 1. How Can Foods High In Fiber Impact Your Gut Health? Bifidobacteria which is a kind of friendly bacteria has become so important, people have been taking this bacterium orally by culturing it. This is because the intake of regular antibiotics as a part of treatment are said to kill some of the healthy bacteria along with the harmful ones. But the point is, why take the supplements when you can naturally increase bifidobacteria inside your gut? 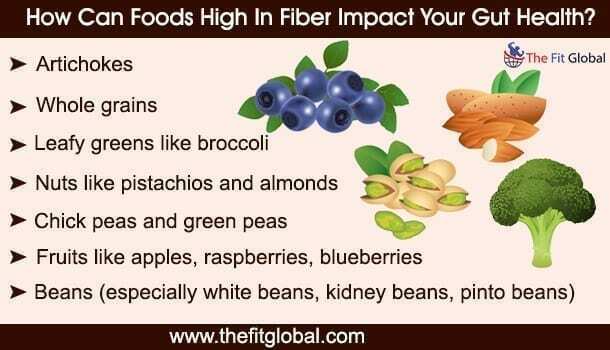 Intake of these fiber-rich foods can favor the growth of the friendly bacteria. Being overweight has countless negative effects on your health! Following the diet plans, exercising regularly and keeping a check on your weight is necessary to prevent obesity. But, not many of us are aware that the intake of certain foods will increase the prebiotics which can in turn increase the number of probiotics (good bacteria). Note – Do not get confused. Probiotics are the kind of healthy bacteria that benefit our gut while prebiotics is the substances that help in the growth of probiotics (good bacteria). Prebiotics can help in reducing cholesterol, reducing the amount of insulin and the number of triglycerides so that you stay away from obesity, hypoglycemia and cardiovascular problems. Prevention is always better than cure. Though pregnancy is a complicated phase of a woman’s life, it gives umpteen chances to improvise the health of a baby at the later stages of its life. Breastfeeding is considered much essential for various reasons, but one unrevealed fact is that it improves the gut power of the baby and makes him less susceptible to certain chronic diseases later. One good advice for the women who have conceived recently is that breastfeeding for at least 6 months after pregnancy can increase the growth of Bifidobacteria. The microbiota (bacterial colony) in the baby is developed enough to digest the sugars present in breast milk and improve the gut health of the infant. 4. 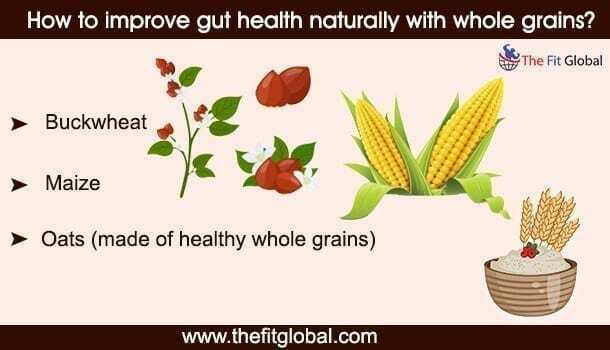 How To Improve Gut Health Naturally With Whole Grains? Including a lot of whole grains in your diet can increase the number of certain carbohydrates called beta glucans. These types of carbs are usually difficult to be absorbed by your small intestine. But the benefit occurs when these carbs travel down into your large intestine where they break down to produce a certain type of good bacteria like lactobacillus and Bacteroides. Lactobacillus helps in increasing your immune power and reducing the bad cholesterol (LDL) which may otherwise cause heart diseases. Bacteroides play a major role in breaking down the food into simpler substances so that they are easily absorbed by your body and add the necessary fuel to your body. Intake of polyphenol-rich foods can lower the blood pressure, reduce the amount of cholesterol, reduce inflammation and reduce oxidative stress. Reduction of oxidative stress is very much essential for a healthy immune system as it helps in an effective functioning of antioxidants in destroying the free radicals whose function is to damage the healthy cells and lower the immune response. If you are a chocolate lover, the good news is that cocoa can help in growth of both the beneficial bacteria lactobacilli and bifidobacteria. Here are 8 best foods that to be immediately added in your diet to improve gut health. Drink more green tea and red wine. Have you ever observed that people who consume yogurt on a regular basis are less susceptible to inflammation and other chronic diseases? 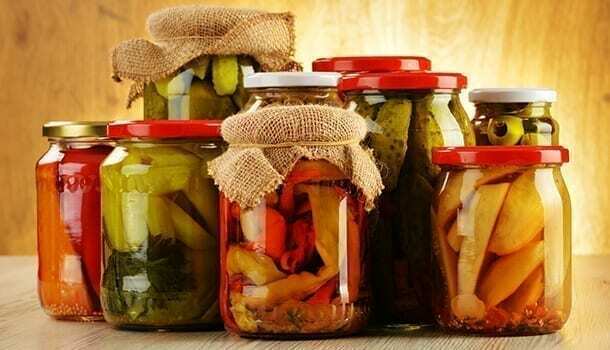 This is because fermented foods are said to reduce harmful bacteria called Enterobacteriaceae (which includes E. coli, Citrobacter, Enterobacter) and other such harmful microbes. If you are intolerant to lactose, a simple tip that you can follow to reduce the symptoms of lactose intolerance is to consume more yogurt. The best benefit of yogurt is that it helps in easy digestion and reduces the chances of constipation which may further lead to a serious condition called Irritable bowel syndrome (IBS). # Tip – Prefer plain yogurt and not the flavored ones as the latter are said to contain more sugars which may cause a weight gain. 7. Why Food Diversity Plays A Major Role In Enhancing Gut Health? 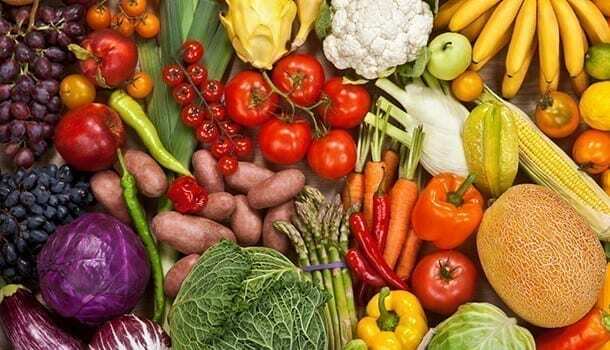 It is always advisable to try a wide range of foods rather than restricting your food choices to a few varieties because apart from being exposed to a lot of nutrients, food diversity brings in a lot of other health benefits. Does food diversity mean you eat what your mind signals you to eat! Well, this habit may land you in a huge trouble! As long as you stay away from sugary foods and other unhealthy foods that may add up the extra calories, trying diverse foods is always a big advantage because this is what happens when you try different cuisines. It helps in reducing the chances of food allergies and food intolerances. It makes you more resistant by decreasing oxidative stress. Food diversity reduces the chances of inflammation which may otherwise cause chronic diseases like diabetes and cardiovascular diseases. 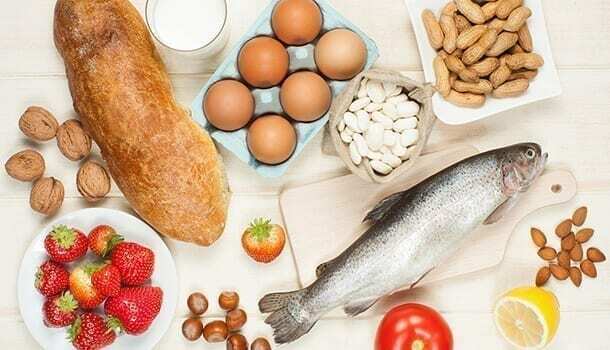 The more varieties of foods you include in your diet, more is the chance of stabilizing your gut(2) microbiota (the habitat of bacteria inside your gut) which contains several beneficial bacteria. Including diverse foods is a natural way to feed your gut with a lot of healthy bacteria without having a need to include gut health supplements. 8. Why Should You Choose A Vegan Diet For Gut Improvement? If you are quite an observant, you will have by now observed that vegans in your friends’ circle are much healthier than meat eaters. This is because vegans depend on plant-based foods whereas meat eaters largely depend on animal-based foods. Studies have revealed that being a vegan is going to benefit your gut by improving the beneficial bacteria and destroying the harmful ones like E. coli and other disease-causing organisms. Studies have even proved that vegetarians are less susceptible to obesity, high cholesterol content in their body and inflammation which is why being a vegan is the best and healthiest choice you can make to improve your gut health. 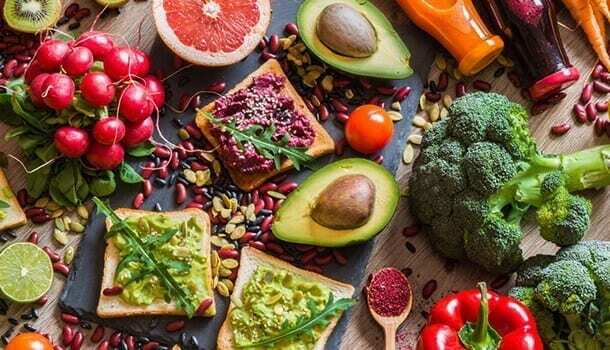 However, one fact that remained unclear was whether it was actually the plant-based diet that improved gut health or avoiding the meat consumption that has benefitted the gut. Think twice before consuming foods loaded with artificial sweeteners because a lot of chaos caused in your digestive tract could be most probably occurring due to the artificially sweetened products that you have consumed all the while. In fact, they are so dangerous that a commonly used artificial sweetener is not only believed to cause obesity but it may also cause cancer. Neotame Drinks, certain fruit juices, frozen desserts, puddings, and dairy products. Acesulfame potassium Chewing gums, soft drinks, frozen desserts, and gelatins. Saccharin Candies, drinks and canned goods. 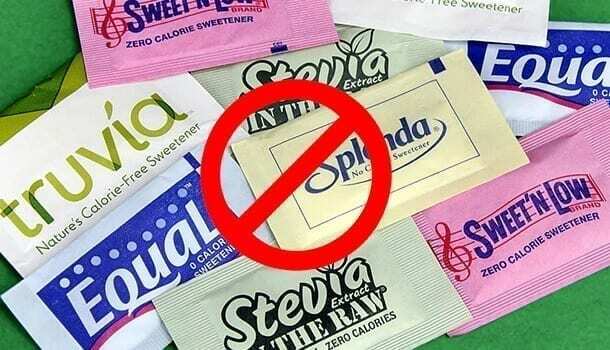 Apart from causing undesirable changes in the blood sugar levels, artificial sweeteners like aspartame are said to cause an increase in the Enterobacteriaceae. 10. 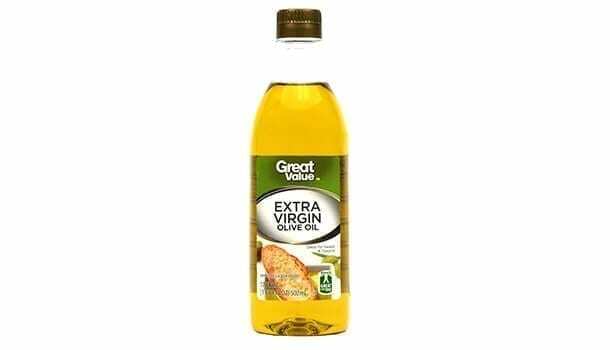 How Extra Virgin Oil Can Favor Your Gut? If you have been using fatty oils for salad dressings or cooking your favorite dishes, opt for a much healthy extra virgin oil and you do not need more than 2 tablespoons of this healthy cooking oil per day. Extra virgin oil is said to be containing anti-inflammatory properties which can reduce the chances of chronic diseases. This credit goes to the polyphenols present in healthy oils that contain healthy microbes that favor(3) the gut. There is a higher chance for you to stay away from various cardiovascular diseases caused due to high blood pressure and high cholesterol since polyphenols help in reducing the oxidative stress to such an extent that it can also reduce the chances of cancer. Also, try choosing the oil that is less refined because when the oil is more refined it may contain fewer polyphenols. Healthy eating is one of the predominant ways to improve gut health, but small habits can make a big difference as your gut condition is determined by your lifestyle choices! 1. What Should Be Your Sleeping Position? Getting at least 8 hours of sleep is essential for a healthy digestion but sleeping in abnormal positions can also cause several gut problems like irritable bowel syndrome and heartburns. Ensure that you sleep on your left side with a little elevation of your head to prevent gut problems. A healthy digestion is never possible without proper water content in your body because it helps in preserving the good bacteria and aids in an easy bowel movement. Sipping water at regular intervals making it up to 1.5-2 liters of water consumption per day should be your goal. Your stomach needs enough time to absorb the nutrients from the foods which is why the most common suggestion given by the nutritionists is to chew better and eat slow. When there is a better digestion, your gut remains clean and healthy. It is quite natural for many of us to be allergic or intolerant to some foods because of the different components of the gut. Being intolerant to gluten can cause discomfort in your stomach. Don’t worry! There is a special gluten-free diet that you can follow to get rid of the problem. You can also avoid dairy products if you are intolerant to lactose, but consuming yogurt regularly can reduce the lactose intolerant symptoms. You can opt for the best gut health supplements like probiotics that help in the growth of good bacteria, it will aid in a better digestion and improving your immunity. You may have to consult your doctor before going for gut health supplements as the reaction varies from one person to the other. You will be surprised to know that stress can also have a negative impact on your gut health. You can try to choose to inculcate any stress-free hobby like aerobics, yoga, meditation, dance, swimming or any sport of your personal interest. Do you know that around 400 varieties of micro-organisms (bacteria) have found their home inside your gut? However, not all microbes harm you. In fact, your body requires some of them for a healthy survival. But, how to improve gut health naturally and enhance your overall health is totally in your hands. 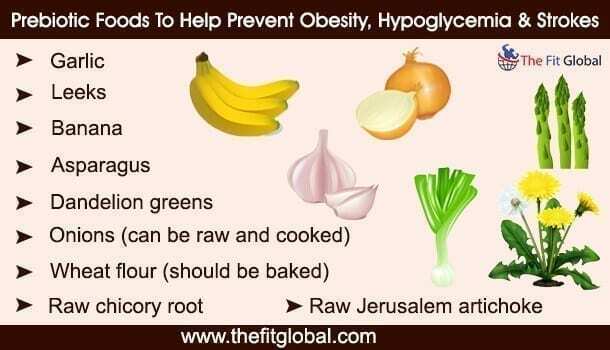 Implementing the above-mentioned ways and following some simple tips promptly will make your gut healthy and happy! Share these simple ways with your friends and family on how to improve gut health naturally so that they get to know the import0ance of gut health and take steps to adapt themselves to a healthy lifestyle effortlessly!